Abstract : Most mountain ranges are formed by the compression and folding of colliding tectonic plates. Subduction of one plate causes large-scale asymmetry while their layered composition (or stratigraphy) explains the multi-scale folded strata observed on real terrains. 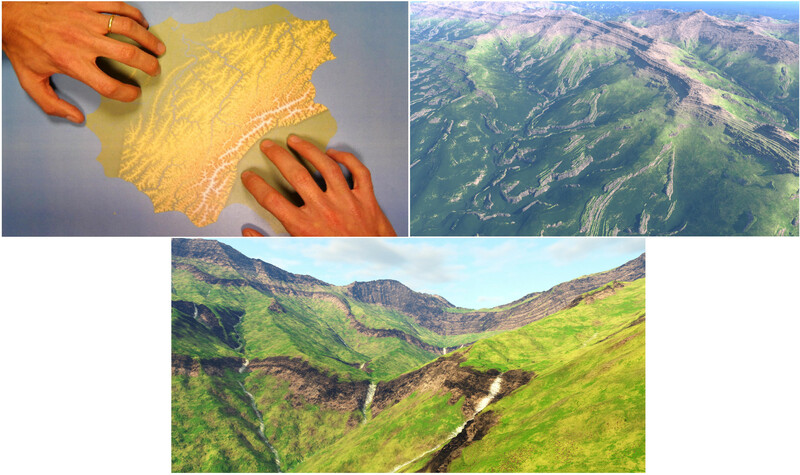 We introduce a novel interactive modeling technique to generate visually plausible, large scale terrains that capture these phenomena. Our method draws on both geological knowledge for consistency and on sculpting systems for user interaction. The user is provided hands-on control on the shape and motion of tectonic plates, represented using a new geologically-inspired model for the Earth crust. The model captures their volume preserving and complex folding behaviors under collision, causing mountains to grow. It generates a volumetric uplift map representing the growth rate of subsurface layers. Erosion and uplift movement are jointly simulated to generate the terrain. The stratigraphy allows us to render folded strata on eroded cliffs. We validated the usability of our sculpting interface through a user study, and compare the visual consistency of the earth crust model with geological simulation results and real terrains.